The strange images sent back from NASA’s Mars Curiosity rover often comprise bizarre rock formation. 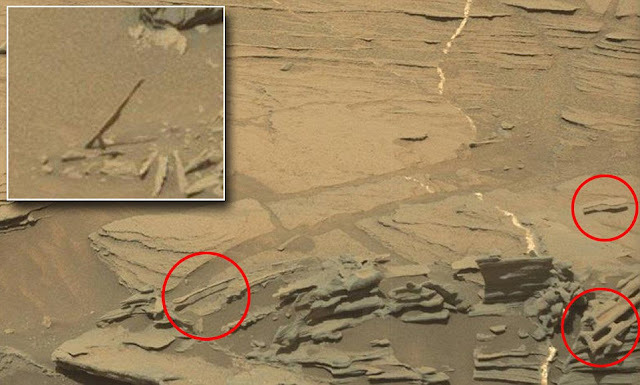 Just this week, one group said they have seen a ‘floating spoon’ on Mars in an image taken by Curiosity’s Mastcam on sol 1089 of the mission, which was quite clear. Now, a new extensive version of the image discloses more 'spoons' and even something similar to a chopstick. The extensive version of the image, generated by NASA, was first shared by Emily Lakdawalla of the The Planetary Society, who clarified the occurrence was a result of the weather conditions on the red planet. She, in a tweet, said that the relative absence of gravity helped to shape this kind of rocks, and but the amount of time (some millions of years) and extreme dryness (like, extremely extreme) is also important.' She also projected the spoon was nearly 10cm long. The ‘spoon’ was revealed by members of the UnmannedSpaceflight.com forum and researchers have already terminated it as a typical case of pareidolia. The 'spoon' and other strange objects found on Mars, actually offers an insight to the oddly calm Martian environment, which can create faint geological structures. With its top-heavy, skinny structure, it’s hard to imagine something alike existing on Earth. This is because, on Earth, if the circumstances are accurate, rocks are crudely shaped by wind erosion. But it is different on Mars, where the atmosphere is quite thin and gravity is weak, these landscapes can be even more delicate making tiny projections, such as this ‘spoon’. And while conspiracy theorists will continue to be shocked by the bizarre structures on the red planet, NASA says they may not be so rare after all.